The American Civil War had been raging for a little over two years. In England Confederate ambassadors were negotiating with Britain to be recognized as a separate nation, which would then allow Britain to provide the much needed war supplies to the manufacturing poor south. The Confederate armies had won most of the major battles so far. Only at the Battle of Antietam in September of 1862, during Robert E. Lee’s first attempt to take the war into the north, did the battle end in a draw. With President Lincoln’s Emancipation Proclamation, issued in January of 1863, Britain, which had abolished slavery in 1833, was having second thoughts about giving their recognition to the rebellion states. And in the western campaign the tide was turning to the north. Major General Ulysses S. Grant had laid siege to Vicksburg, the last major Confederate stronghold on the Mississippi River. After his success at the battle of Chancellorsville Gen. Robert E. Lee know that he needed to shift the focus from the west. Gen. Lee believed that if he attacked as far north as Harrisburg or Philadelphia Pennsylvania he would show England that the Confederacy was still strong, and he hoped also to influence Northern politicians into giving up on the war. Lee began his second invasion of the north by taking his Army of Northern Virginia up the Shenandoah Valley into Pennsylvania. Hearing that the Union Army had crossed the Potomac River, and not knowing its strength or location, Lee order his army to concentration in the town of Cashtown Pennsylvania, eight miles from the town of Gettysburg. Hearing that there was a shoe factory in Gettysburg Brig. Gen. J. Johnston Pettgrew took a company of the North Carolinians to Gettysburg in search of supplies. As they approached they noticed Union cavalry arriving to the south of the town. Pettgrew and his men returned to Cashtown and reported what he saw to his two commanders, Generals Hill and Heth. Neither general believed that it could be a large Union force, but rather only the Pennsylvania militia. 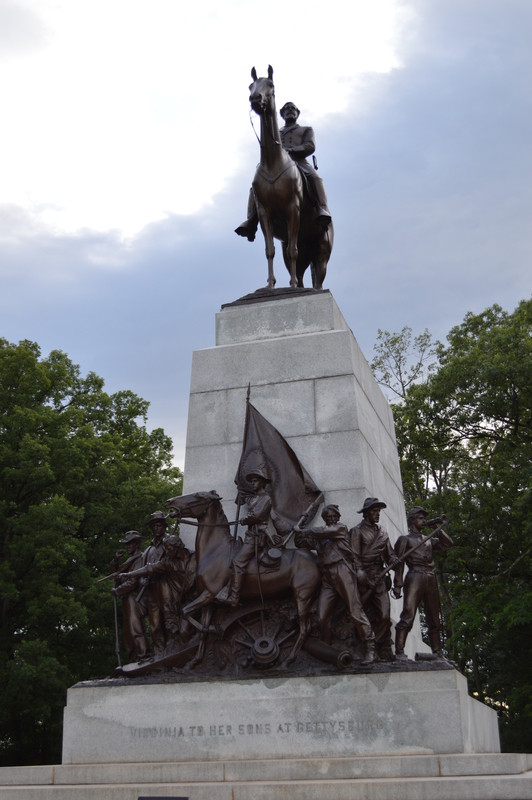 They disobeyed Lee’s orders to remain at Cashtown until the entire army had arrived, and decided to make a major reconnaissance in force to determine the size and strength of the enemy at Gettysburg. 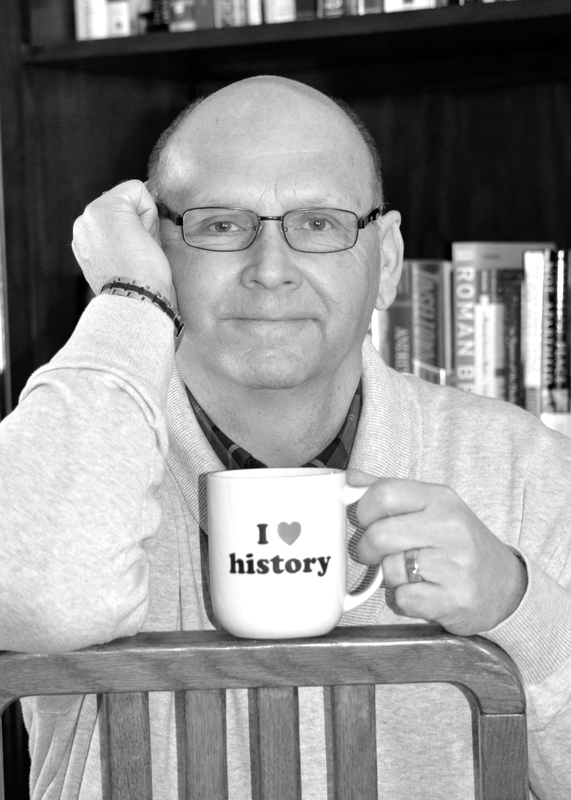 It was Union cavalry officer Brig. Gen. John Buford, and his small cavalry division that Pettgrew had seen the previous day. Buford expected the Confederate army to move on Gettysburg from the northwest that day, far in advance of the newly named commander Maj. Gen. George Meade and the main body of the Army of the Potomac, marching in from the south. Buford needed to keep Lee’s men from entering the town and taking up the better positions. To the west of the town where three ridges: Herr, McPherson and Seminary, perfect defensive positions for Buford’s small company to hold a delaying action against the larger Army of Northern Virginia. At 7:30 am, the Confederate columns advancing on the Chambersburg Pike were surprised to be fired upon by the smaller Union cavalry. The Confederates continued to receive stronger and stronger resistance from the dismounted solders as they fired from behind fencepost. Throughout the morning the Union cavalry held back the advance of the Confederates. The mission for the Union was to keep Lee from getting the higher grounds of Cemetery Hill, Cemetery Ridge and Culp’s Hill. The fighting to hold ground and to gain ground continued throughout the afternoon, southern troops heading to Cashtown as ordered by Lee heard of the fighting and turn south toward Gettysburg. To the south Maj. Gen. Oliver O. Howard, commanding the advance unites of Meade’s army, also hearing of the fighting raced north toward the town. The afternoon of July 1st was a constant juggling for positions by the two armys. Even though the advance unites of the Union Army had arrived they still didn’t have enough troops to effectively advance on Lee’s army, that was pouring in from the north. Gen. Howard ordered a retreat to the high ground south of town, Cemetery Hill. Gen. Lee arrived and seeing the Union forces occupying Cemetery Hill he asked Gen. Ewell to take the hill, “if practicable.” Ewell didn’t think it was practicable, and the south missed a major opportunity. Some consider the first day of the battle simply as a prelude to the next two days. However, in itself that first day has been ranked as the 23rd largest engagement of the Civil War. Both the Union and Confederate lines are entrenched on the field of battle. Gen. Robert E. Lee launches a massive attack on the two Union flanks. 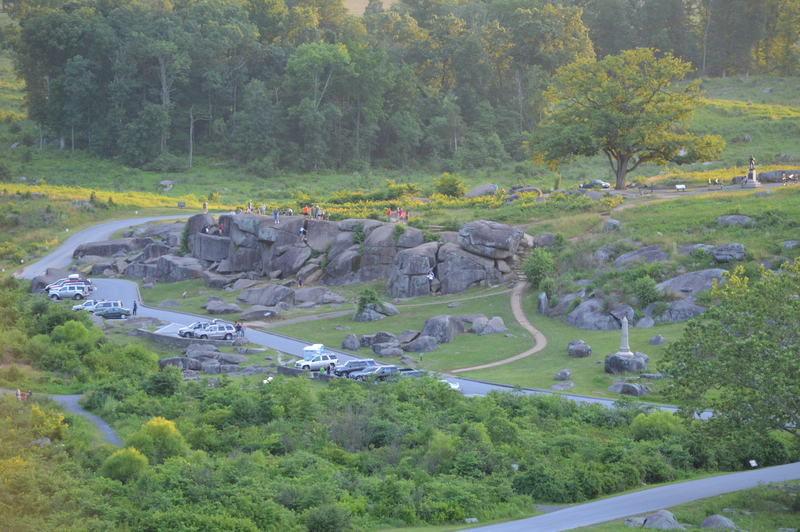 On the right at Culp’s and Cemetery Hills, and on the left, Little Round Top hill. There are heavy loses to the southern troops at such infamous places as the “Wheatfield,” “Devils Den,” and the “Peach Orchard.” Finally, men from the 15th Alabama swing around under the heavy fire coming from the hilltop and begin to charge up the far left flank of the Little Round Top. 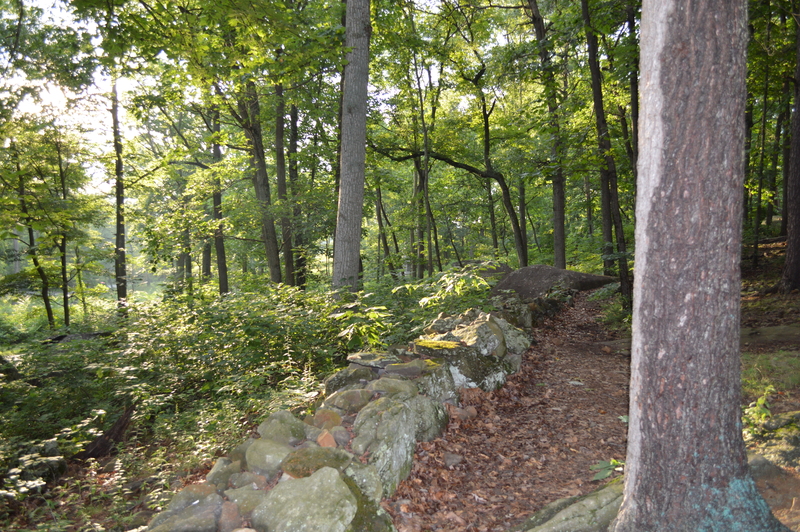 At the top of the hill is Joshua Chamberlain and his men of the 20th Maine. Charge after charge is made by the men of the 15th, but Maine holds the hill and the Union left flank. Chamberlain’s men are now low on ammunition, one more charge and they will be overrun. Chamberlain plans a bold move, with the next southern charge he has his men on the left do a bayonet counter charge, swinging down and across the hill forcing the Confederates to face two attacking fronts. Maine holds the hill and saves the Union left flank, as well as capturing 101sounthern soldiers. For this Joshua Chamber, the professor from Brewer Maine, is awarded the Medal of Honor. The city of Brewer is just across the Panobscot River from Bangor. In the Hill House Museum of the Bangor Historical Society you can see the sword used by Chamberlain in the that famous battle. Also, just across the river in Brewer, at the corner of Wilson and Main Streets is a statue of Chamberlain, standing atop a hill made to look like the Little Round Top. 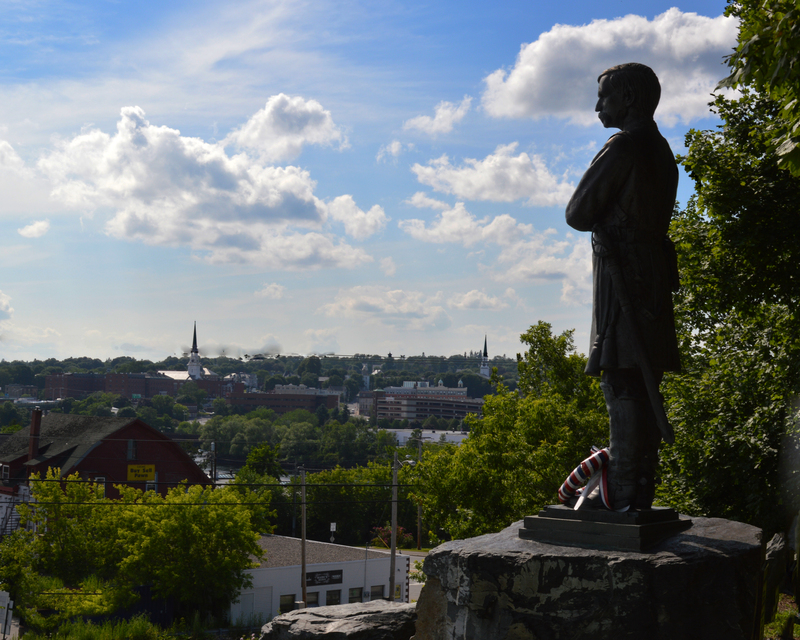 The statue of Joshua Chamberlain in Brewer, Maine. Friday July 3rd: Gen. Robert E. Lee wanted to renew the battle using the basic plan of the previous day, again to attack the two flanks of the Union line. However at dawn the Union artillery began firing on the Confederate lines from Culp’s Hill, which lasted till around 11 am. This caused Lee to change his plans; instead he would have Gen. Longstreet’s Virginia division under Pickett, along with six brigades from A.P. Hill, attack the right center of the Union line on Cemetery Ridge. To prepare for this charge Lee ordered all of his artillery to fire, in hopes of weakening the Union positions. At around 1 pm up to 170 Confederate canon began their bombardment, one of the largest of the war. About fifteen minutes later 80 Union guns on the ridge began to return fire. At about 3 pm the canon fire subsided, and 12,500 Southern soldiers began the three-quarters of a mile attack across the open field toward the Union lines on the ridge, “Pickett’s Charge.” The Union artillery near the center of the ridge had held their fire during the earlier artillery exchange, waiting for this attack to happen, they now unleashed their fury on the approaching Confederates. 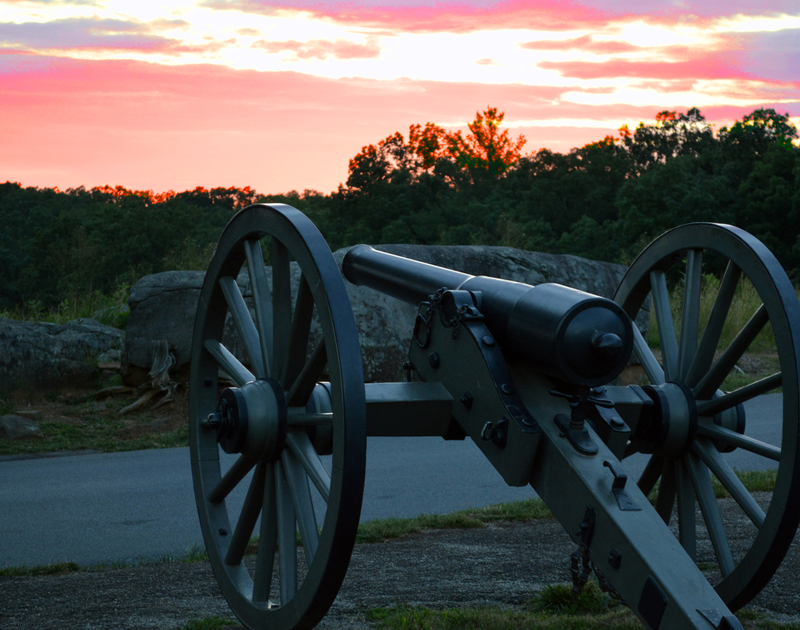 In addition there was supportive Union artillery fire coming from Cemetery Hill and Little Round Top. 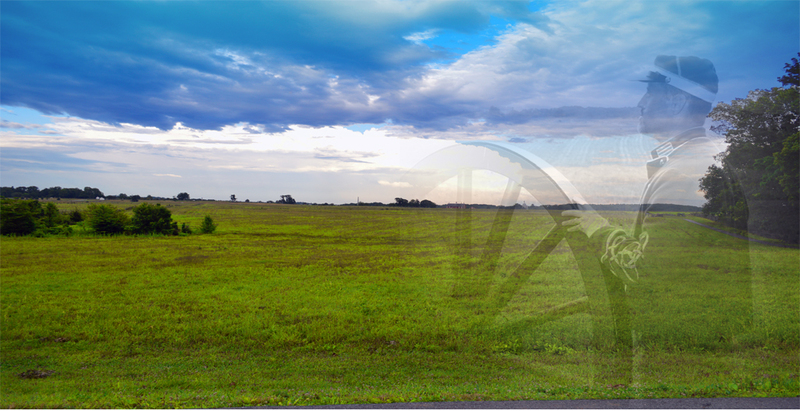 Crossing the field, wading through the tall grass and climbing fences, the Confederates came. They were first cut down by exploding canon shells and canister, and then from the musket fire of the entrenched Union line, and yet on they still came. Finally a small group of Confederates reached the top of the ridge at a place later called “the Angle,” and broke through, this was their “high water mark,” but quickly the Union line was reinforced, and the Confederate attack was repulsed. After which the proud Virginians began to fall back. Nearly half of the southern soldiers that came out of the ridge line on the Confederate side that early afternoon didn’t returned to it, the battle was over. The next day, July 4th, the eighty-seventh anniversary of the ratification of the Declarations of Independence, Robert E. Lee began his withdrawal back south. Although the Civil War would continue for another two years the battle of Gettysburg, and also the fall of Vicksburg to Grant on that same July 4th, ended the south’s attempts to take the war into the north. Now the south mostly fought defensive battles. The end of the American Civil War marked the end of the southern states ideas of secession, and preserved the Union of the United States of America.